By fostering a rhetorical environment, Dominion strives to avoid “programming” students for a particular worldview, instead inviting them to explore each side of an issue or idea while guiding them toward truth. This approach produces students who are not dogmatically certain but who are faithfully confident in their faith. Many schools claim to prepare students to think about life through the lens of a Christian worldview, but what exactly do they mean by that? 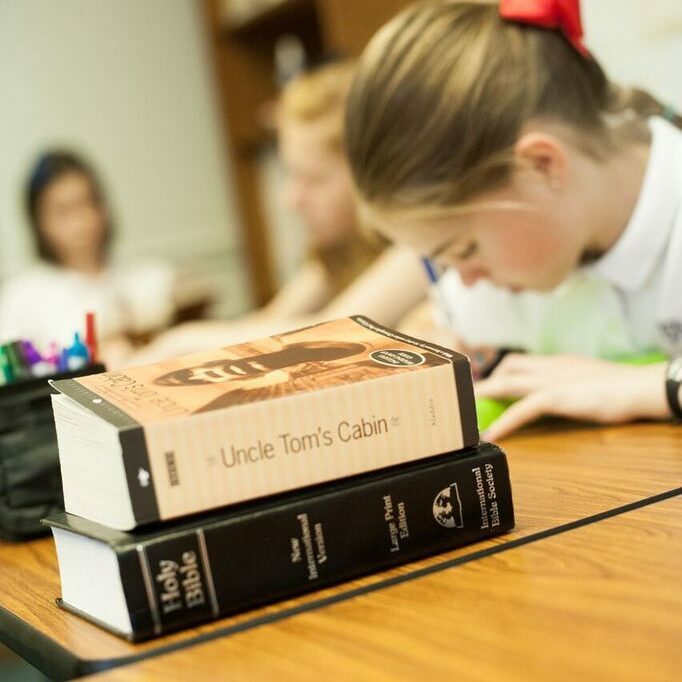 Dominion’s approach to teaching a biblical worldview aims to produce students who are mightily equipped to engage with non-believers at the world’s intellectual table. Believing that truth is always on God’s side, we are not afraid to explore ideas, traditions, and worldviews that differ from our own. Yet, we also remain committed to an orthodox Protestant Christian faith as defined by our statement of beliefs and the teachings of the leading thinkers of the Protestant Reformation. As our upper school Christian Studies teacher puts it, Dominion helps students understand that faith fills the gap between having a “confident” faith and a “certain one.” Rather than programming students to think in a particular manner, we guide their exploration of the world while they are under the authority of Christian parents, teachers, and church leaders. Requiring students to engage with alternative worldviews equips them more thoroughly to transform culture for the sake of Christ in their respective callings and vocations. More than all of this, we believe that teaching through the lens of a Biblical worldview is necessary, but incomplete. Recognizing that man is not simply an intellectual being, but also a desiring being, our ultimate goal is to shape students' affections towards the Kingdom. Learn more about what sets us apart from other Christian schools by watching the video in the sidebar.